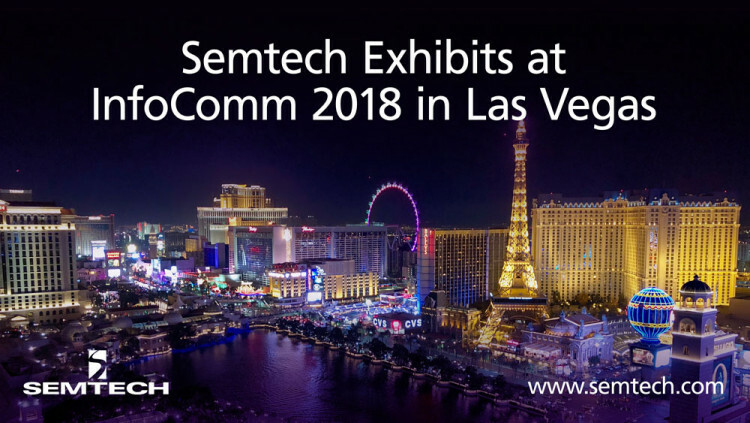 CAMARILLO, Calif. – May 24, 2018 – Semtech Corporation (Nasdaq: SMTC), a leading supplier of high performance analog, mixed-signal semiconductors and advanced algorithms, today announced participation at InfoComm 2018 in Las Vegas, June 6-8, at the SDVoE AllianceTM booth N720. Helgi Sigurdsson, Senior Product Manager of AptoVision products in Semtech’s Signal Integrity Products Group, will present educational sessions titled “Video Over 1G Ethernet: The Ugly Truth,” each day in the SDVoE Alliance booth. Attendees of the session will learn about the “codec triangle” – the tradeoff between image quality, latency and bandwidth. They will have the opportunity to compare image quality between codecs like MJPEG at 1G against pixel-pipeline codecs working at 10G and learn how to choose the right codec for their particular applications. For a complete list of the SDVoE 20/20 in-booth educational sessions, and to pre-register, visit the SDVoE website. Semtech’s BlueRiver™ platform will power an array of demonstrations covering key topics important to AV professionals, including how to deliver matrix switch performance with uncompromised quality and sub-millisecond latency over IP, and how to enable true AV/IT convergence using 10G networks. As a founding member of the SDVoE Alliance, Semtech will provide technical experts to showcase the advanced AV processing capabilities built into BlueRiver NT2000 for video wall and multiview applications, as well as the comprehensive BlueRiver application programming interface (API) that enables AV-over-IP developers to create outstanding user experiences in AV system designs. SDVoE is an initialism for “Software Defined Video over Ethernet.” The SDVoE Alliance is a non-profit consortium of technology providers collaborating to standardize the adoption of Ethernet to transport AV signals in professional AV environments, and to create an ecosystem around SDVoE technology allowing software to define AV applications. The SDVoE Alliance participates in tradeshows and conferences, publishes white papers and case studies and promotes SDVoE technology, and solutions based on the technology, to system integrators, designers and consultants. Training and installer certification are also part of the mandate. The SDVoE Alliance founding members are Aquantia, Christie Digital, NETGEAR, Semtech, Sony and ZeeVee. All interested parties are invited to join the alliance and work toward its goals. For more information, visit www.sdvoe.org. All statements contained herein that are not statements of historical fact, including statements that use the words “will,” “to create,” “to replace,” “designed to” or other similar words or expressions, that describe Semtech Corporation’s or its management’s future plans, objectives or goals are “forward-looking statements” and are made pursuant to the Safe-Harbor provisions of the Private Securities Litigation Reform Act of 1995, as amended. Such forward-looking statements involve known and unknown risks, uncertainties and other factors that could cause the actual results of Semtech Corporation to be materially different from the historical results and/or from any future results or outcomes expressed or implied by such forward-looking statements. Such factors are further addressed in Semtech Corporation’s annual and quarterly reports, and in other documents or reports, filed with the Securities and Exchange Commission (www.sec.gov) including, without limitation, information under the captions “Management’s Discussion and Analysis of Financial Condition and Results of Operations” and “Risk Factors.” Semtech Corporation assumes no obligation to update any forward-looking statements in order to reflect events or circumstances that may arise after the date of this release, except as required by law. Semtech and the Semtech logo are registered trademarks, and BlueRiver is a trademark, of Semtech Corporation or its affiliates.